We caught up with SAI Paris Program Coordinator Jenn, who is contributing to our blog this month. Jenn is including her favorite recipe for winter: Vin Chaud Aux Epices, a spicy, warm French classic. 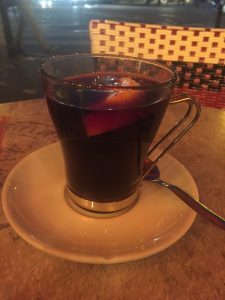 In France like in other European countries, as soon as the weather starts to cool off, cafés start serving vin chaud (hot wine). Simple hot wine can be found on the menu, as well as vin chaud aux épices (hot mulled wine), although this last one is typically found mostly in Christmas markets and not always in cafés. The Romans were said to have been the first to spice and heat wine, which then spread across Europe. Read on to learn how to make this easy and simple drink. Directions: Mix all the above ingredients in a pot and bring to a slow boil. Let bubble for 5 minutes to allow the wine to soak up the spices. Serve really hot using a slotted spoon to filter out spices before drinking.